DON WILLIAMSON, who has turned a passion for gardening into his life's work, has a varied background in landscaping, golf course construction and management and now garden writing. He also has extensive experience in the design and construction of both annual and perennial beds in formal landscape settings. Don has a degree in applied horticultural technology and professional certificates in turf management. MARIANNE BINETTI reaches over a million readers each week in the Seattle Post-Intelligencer with her syndicated garden column, which also is carried in 20 newspapers across Washington State. She contributes to several national magazines, including Better Homes and Gardens, Woman's Day and Flower and Garden. Marianne's light-hearted approach to gardening appeals to television and radio audiences as well. She has made a number of guest appearances on HGTV, the Discovery Channel and Gardening in America with Ed Hume. 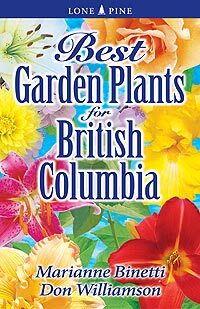 Marianne also is a popular speaker at garden centers and before horticulture societies throughout Washington and Oregon.